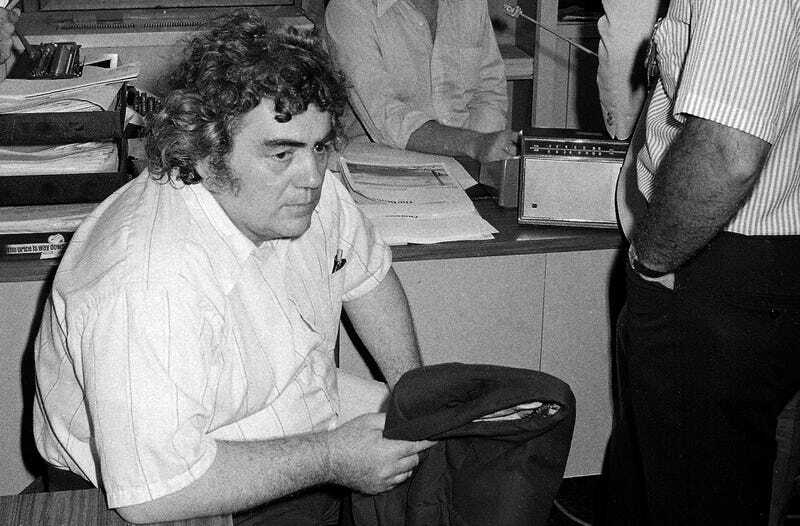 It is hard to realize just how far away New York is by every conceivable measure unless you are in Salt Lake City when you are introduced to the world Jimmy Breslin populated with characters, con men and crusaders. I felt the sense of distance for the first time more than half a century ago, and it came back to me in a rush Sunday when I heard that Breslin had died at 88, as great a newspaper columnist as ever raced a deadline or cursed an editor, a giant whose heart beat in rhythm with that of the teeming, sharp-tongued but ultimately beguiling city he captured in print. Once again I was that kid in Salt Lake who was beyond naïve when my future rose up before me in the form of a Breslin column about an arsonist named Marvin the Torch. Marvin’s life goal was to blow the roof off a building without bending any of the nails. Until then, it hadn’t occurred to me that you could write about people like that in a newspaper. After the shock passed—and after I stopped laughing—I fell under the same spell as dreamers at every other journalism school. Of course they were far smarter and savvier than I was. More worldly, too. And definitely better connected. Some had even met him. As I stepped out of the shadow of the Mormon Temple, the best I could do to advance my ambitions was to march off to Northwestern to get a master’s degree in journalism, a move that surely would have convinced Breslin I was beyond hope. I got the master’s, though. When I went back to Salt Lake, I got something else: my draft notice. It was 1968 and the war in Vietnam was still getting kids killed for no worthwhile reason that I’ve ever discovered. Now the U.S. Army wanted me. On the day before I was to be inducted, I received a copy of a book I’d had to special order from a local store: The World of Jimmy Breslin, a collection of columns from his glory years at the New York Herald Tribune. The paper, which also provided sanctuary for such supernovas as Tom Wolfe, Red Smith and Charles Portis, had gone out of business two years earlier, foreshadowing times that would be grimmer by far. Mortality, however, was far from my mind. I was too busy using my last day of freedom to plow through Breslin at the top of his game—not just the characters like Marvin the Torch and the bookie Fat Thomas and Sam Silverware, a thief who specialized in cutlery, but the serious stuff about the civil rights movement and marines dying in a faraway jungle and, most of all, JFK’s assassination. Breslin wrote about the doctor who couldn’t save the president from Lee Harvey Oswald’s bullets, and then he wrote about the man who dug John F. Kennedy’s grave. I told myself that if I came out the other side of my two years in the Army, I wanted to do what Jimmy Breslin did. It was too quiet for a barroom. It was almost too quiet for a funeral. Richard Milhous Nixon was up on the TV screen in the corner at Al Flora’s Sports Bar in red-white-and-blue Arbutus last night. He was resigning as president of the United States. Nearly 44 years later, I’m nowhere near as infatuated with those sentences as I was when I wrote them, but they did help me get in the door at the Washington Post as a sports writer in 1975. To stay, I had to survive a meeting with the paper’s legendary, Nixon-regime-sinking executive editor, Ben Bradlee. I can’t remember a thing about our 10 minutes together except this: He told me how much he liked my “Jimmy Breslin style.” I think he meant it as a compliment. But the Post’s staff wasn’t made up of writers and reporters who survived and prospered by copping other people’s moves. These were competitive, hard-driving people with big brains and, in some cases, bigger egos. They were determined to succeed on the strength of their own talent—okay, and some office politicking and backstabbing, too. Maybe that was what Bradlee, a master of a Post phenomenon called “creative tension,” was letting me know. Maybe he wanted to see if I was smart enough to get the hint. Miracle of miracles, I was. For better or worse, my own style began to emerge. But the lessons I learned by reading Breslin remained as I moved on to a sports column of my own in Chicago and Philadelphia: The power of describing scenes to advance a story, the use of dialogue rich with the quirks of everyday speech, the eye for small but telling details, the belief that the best and truest stories can often be found in the loser’s clubhouse or campaign headquarters. None of these, however, was a Breslin invention. He had learned by reading his own heroes, W.C. Heinz and Damon Runyon. He even wrote a biography of Runyon, a flinty piece of work, but then Breslin was a flinty piece of work, too. Or so I gathered as I followed his career as he bounced from a short stay at the pre-Murdoch New York Post to a longer, happier gig at Long Island’s Newsday to his Pulitzer Prize-winning stand at the New York Daily News. He reigned with Chicago’s Mike Royko, New York’s Pete Hamill, and Philly’s Pete Dexter as the premier city columnists of their time. He was cranky and opinionated and, every now and again, bigoted. He smoked too much, but in his day, all newspapermen did. They drank too much too, and so did Breslin until he stopped. He was always better off when he was working—columns, magazine pieces, non-fiction books, novels. He championed the lost, the forgotten, and the fresh off the boat in ways that will never occur to that vampire Donald Trump. He wrote about politics and the Mob, sports, social issues and his own health. When I saw a book called I Want to Thank My Brain for Remembering Me, I knew instinctively he had written it. But I never met the man. The closest I came was at Madison Square Garden, 1985, Georgetown vs. St. John’s, Patrick Ewing vs. Chris Mullen when college basketball’s holy wars could last four years. I’d stared at Breslin’s column photos and dust-jacket likenesses long enough to know it was him. I turned away for a second, and when I turned back, he was gone. Maybe it was better that way. Sometimes you meet your heroes and suddenly they aren’t heroes anymore. It turned out that Breslin wrote his final daily column that fall. I read it to my literary journalism class and damn near choked up when I came to his last line: “Thanks for the use of the hall.” It was vintage Breslin, straight out of some old brick pile that provided a home for bingo or union meetings or Golden Gloves fights. Pure New York from a guy who opened the world up for a generation of writers eager to serve their readers life one slice at a time. He opened us up to a world of possibilities. What we did with them was our concern. He had his own work to do. No one ever did it better. John Schulian received the 2016 PEN ESPN Lifetime Achievement Award for Literary Sports Writing.